The existing landscape consisted of paver patio areas with timber retaining walls. Staying within the existing layout we began a massive overhaul of the entire lakeside. New, flowing fieldstone walls retained the walk in beach area and continued along the shoreline to retain the entertainment patios. 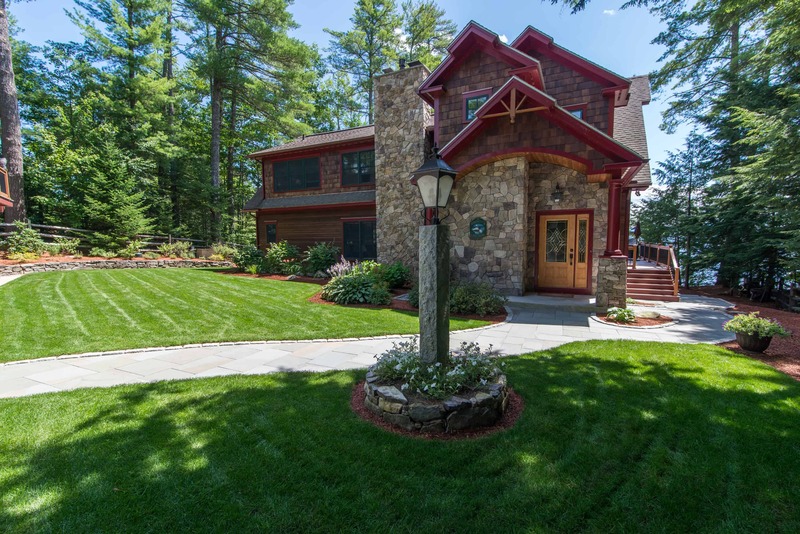 All the fieldstone was hand-picked from Ossipee Mountain by our crew to ensure the best looking stone with the most character was used. Small foundation walls and a circular planter in the middle of the patio were also reconstructed with the same fieldstone. All walls were capped with custom cut granite to provide additional seating for guests. The largest feat of this project was the 2,000 + sq. ft. patio spaces that had to have perfect pattern lines and pitches to properly handle storm waters. A network of wiring and piping for lighting and irrigation were sleeved underneath the patio prior to our base construction. We pride ourselves on taking the extra time to ensure we have a solid and well draining base. 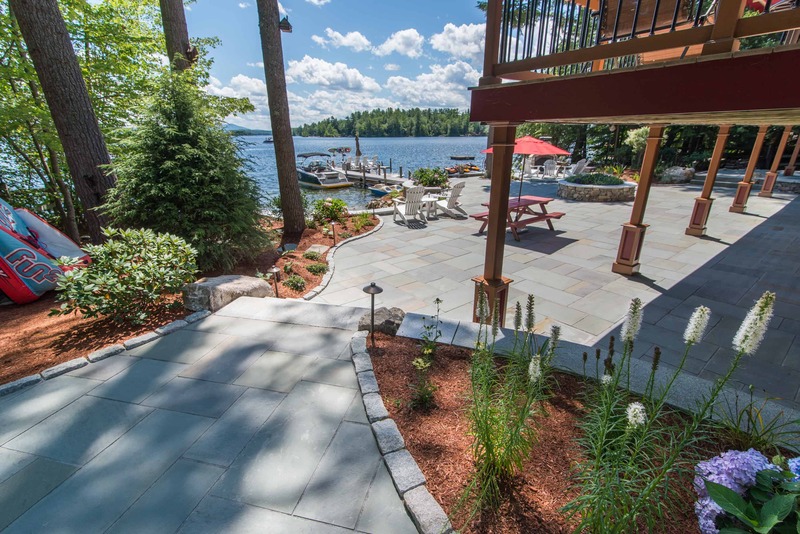 Our construction includes 6-8″ of 1.5″ crushed stone, filter fabric and coarse bedding sand before we start with the finished pattern bluestone surface. We finished off our patio joints using a polymeric sand, which hardens in place to create a clean seal on the patio joints. Using inset cobblestone we accented the patio curves and walkway edges. This also helps direct storm water for proper run off. 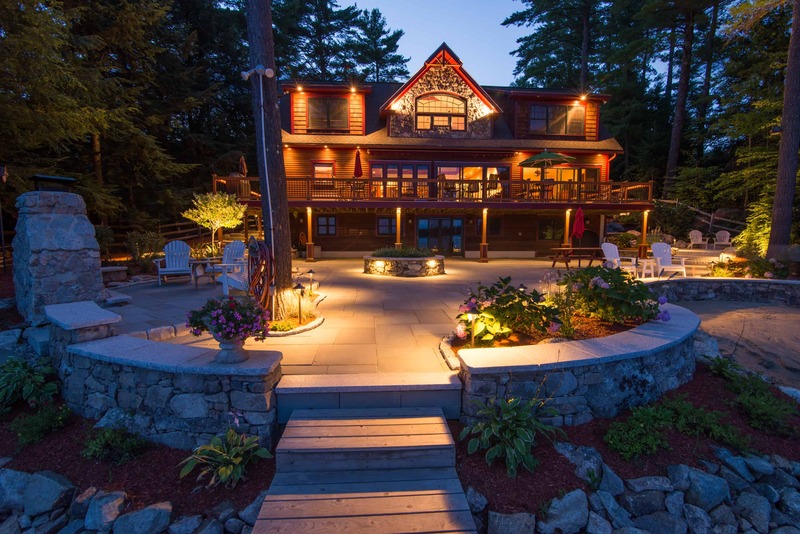 Other project items included adding stone veneer accent to the front door wall and the lakeside gable end of the house. We finished off the deck posts with composite wood bases. The landscape was not complete until we brought in some plant life to the garden nooks. 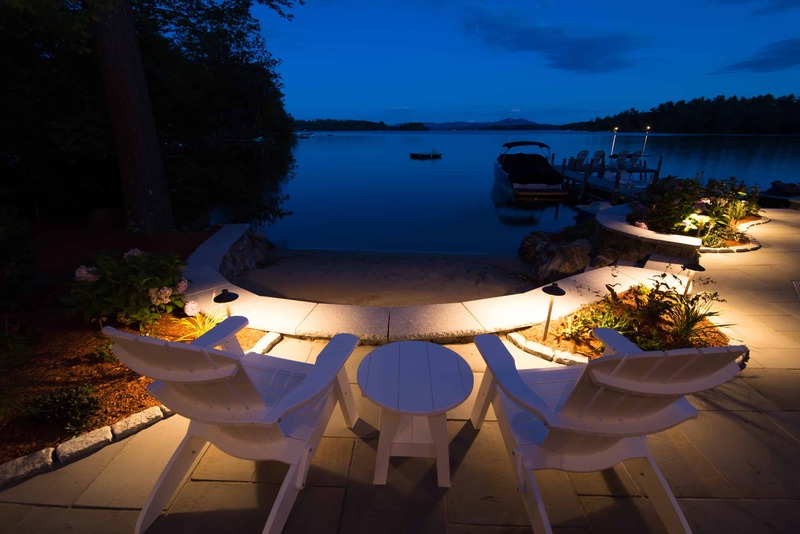 This was followed up by drip irrigation and several landscape lighting fixtures that bring out the true beauty of the landscape in the evening. The finished product is a large scale piece of work. Every aspect of the hardscape and masonry work together to create a truly unique space for entertaining and relaxation.